According to Joseph Person of the Charlotte Observer, S Kurt Coleman will switch from strong safety back to free safety in 2017. Coleman played free safety in 2015, but was moved to strong safety following Roman Harper’s departure. Coleman finished 2016 with a respectable grade of 79.2, ranking 41st out of 90. This was down from his previous season (where he played primarily free safety) grade of 81.6, ranking 17th out of 87. 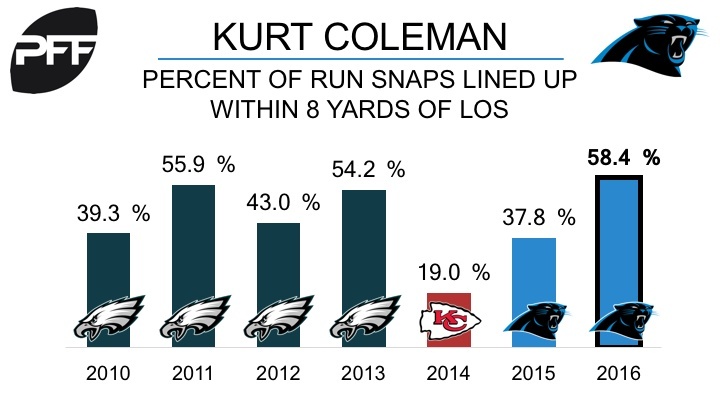 Coleman lined up within eight yards of the line of scrimmage on 58.4% of his run snaps in 2016, compared to just 37.8% of the time in 2015. He ranked sixth and fifth in stop percentage within eight yards respectively, in 2015 and 2016. After recording seven interceptions in 2015, Coleman had just four in 2016. His playmaker index (percentage of targets into coverage a player earns either an INT or PD) dropped from 25% in 2015 to 17.6% in 2016.